If your firm is looking to obtain an Airport Concessions Contract and is minority or woman owned an ACDBE Certification can provide your firm with a preference for obtaining those contracts. 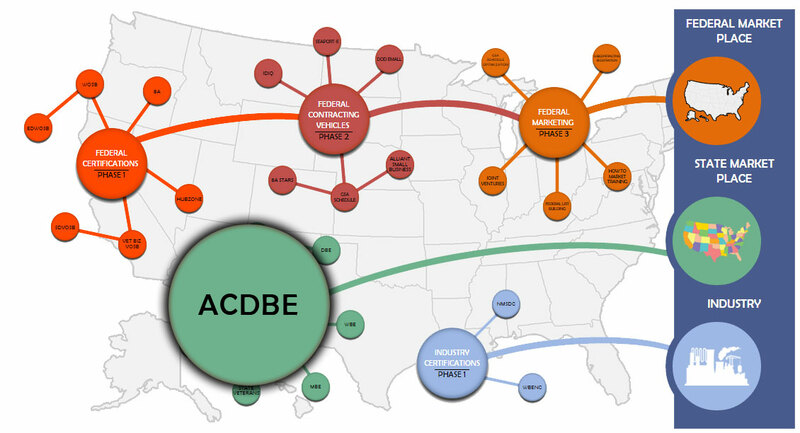 Enacted in 1983, the ACDBE program requires that a minimum of 10% of federal funds provided for transit assistance be spend with DBE/ACDBE certified firms. These Certifications are managed by the Department of Transportation and the ACDBE more directly by the FAA. All airports that are recipients of FAA grants for airport planning or development and who will award prime contracts exceeding $250,000 in FAA funds must have an ACDBE program in place. Generally speaking at a large airport approximately 20% or more of the concession contracts are awarded to ACDBE firms. Type of Business Any for-profit business that is independent. Initial interview and strategy session to roadmap your ACDBE application. This process generally takes between 1.5 and 2.5 hours. Document checklist is created specific to your firm. This will be a list of all the enclosures and documents needed to complete the ACDBE application. An analyst will work on your ACDBE package immediately upon submission to our firm. It is customary for firms seeking this certification to have future bid considerations in play and we are very mindful of those issues. We review all documentation submitted for potential problems. The Department of Transportation places a high level of scrutiny on ACDBE applications and therefore review all documents thoroughly. We will communicate with you (by e-mail and phone) throughout the ACDBE application process insuring we are staying on the critical path for a successful and timely completion. An analyst will interview you and prepare the socially disadvantaged narrative if you are a non-presumed group applicant as that is a critical piece of your ACDBE application. We will do the entire application, double-checking everything to be sure it meets all 49 CFR part 23 guidelines and we will assemble the entire package (usually 3-4 inches thick) of paperwork. Finally, we will tab all the places in the ACDBE Application where your signature is needed and will send the completed package so you can sign and forward it to the DOT review board. When we send it, your ACDBE application is ready for the DOT review.